How is Ford supposed to make its pickup truck story get any better than it already is? That’s a tough one. 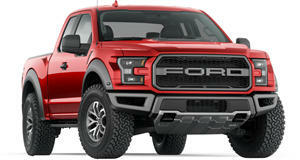 It already leads the truck segment with the best selling vehicle in the US and then it decided to put a chokehold on the rampant aftermarket truck tuning business with the almighty Raptor. The only glimmer of hope that its closest competitor had was the Chevy Colorado and its ZR2 package that turns it into a miniature Raptor competitor. Back to the question though. How does Ford improve the situation of its truck department? By putting the hurt on Chevrolet of course. Car and Driver, back from a smash and grab spy shot mission, has found evidence that that’s exactly what is about to happen. There's already a new Ranger in the pipeline that’s crushing hopes and dreams over at GM, which saw a glimmer of light when the mid-size pickup truck segment rose from the grave while Ford and FCA were nowhere to be found. What GM didn't anticipate is Ford building a Raptorized version of the Ranger. A truck like that would stamp the slightly underpowered Chevy Colorado ZR2 or Toyota Tacoma TRD Pro into submission. No one else saw it coming for that matter, but spy shots don’t lie. The story they tell is full of parallels to the F-150 Raptor.